Suave? Sophisticated? Silly? Nope, all of those are incorrect. The "S" in David S. Pumpkins simply stands for "Simon." Why? No clue. Actually, the whole David S. Pumpkin character is a complete conundrum but we're not vexed by it; we're living for it. It doesn't matter what he does, where he's from, or what he's doing inside that haunted elevator, he's a character shrouded in mystery and possesses the casual creepiness we strive for. David S. Pumpkins is provocative. David S. Pumpkins is our muse. Always. If you feel as inspired by the sensational SNL character as we do, then don the iconic pumpkin suit and start surprising unsuspecting couples in elevators. Also, don't forget to pick up this very helpful accessory to pair with your pumpkin suit. The David S. Pumpkins wig is made from curly synthetic hair and features a bizarre patch of white hair in front and a comfortable elastic cap. Stretch it over your noggin' and release your inner weirdo. 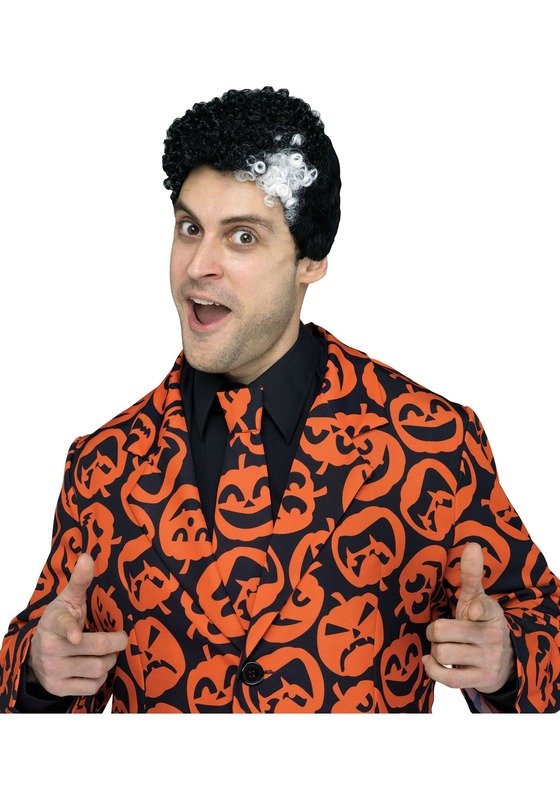 Congratulations, you now have everything needed to become the latest Halloween idol, the "Santa Claus" of Halloween if you will, the one and only David S. Pumpkins. Get two of your friends to dress up as the bizarre skeleton backup dancers to complete your transformation. Any questions?